It’s finally time to pay back your student loan debt. But how do you get started when it seems overwhelming? You graduated college and your grace period is up. It’s time to pay back those pesky student loans. Student loan debt has become a way of life for many of us. After seeing your total balance, you may be overcome with shock – maybe even a little panic. “How will I ever pay this back?” you think. I’ve been there. Just a few years ago, that was me. I could hardly believe how much debt I was in and how much interest was tacked on to my loans. I felt paralyzed by debt, and didn’t know how to move forward. At the time, I had $68,000 in student loans with no full-time job in sight. While my situation was less than ideal, I knew that I wanted my loans gone yesterday. I knew that getting out of debt was really important to me because I wanted the freedom to travel and experience everything life has to offer. Currently, high student debt levels are leading to delayed marriages, homeownership, and even delayed retirement. I didn’t want that to be me. Now after several years of hustling, last year I finally paid off my debt. It felt surreal. It’s not an easy process, nor is there a magic pill that can help it all go away. But there are ways you can speed things up and become debt-free. Here are seven steps you can take to pay off debt quickly. If you really want to get out of debt fast, it’s imperative that you pay more than the minimum. Minimum payments are just that — the minimum. Look at your income and expenses and see how much you can afford to put towards debt each month. Even an extra $50 can help. The key is to pay more than the minimum, possibly doubling your payments if you can. Most student loan servicers offer a 0.25 percent reduction in interest for borrowers who sign up for auto-pay. Accruing interest on your loans quickly tacks more money onto your balance, making it tough to pay off. Any reduction in interest can save you money in the long run, so your payments can go to the principal balance and not just interest. Instead of making monthly payments on your debt, make biweekly payments instead. You don’t even have to pay more – just divide your monthly payment in half and make biweekly payments. You will pay less in interest over time and effortlessly make an extra payment. How? When you make monthly payments, you’ll make 12 total payments. By making biweekly payments, you’ll make 26 half-payments, which equates to 13 total payments. If you really want to get out of debt as soon as possible, commit all extra funds to debt. Did you get a hefty tax refund? Birthday money? Any time you get “extra” money — such as a tax refund, birthday money, or an inheritance — use it to reduce your debt. After all, the “extra” money won’t affect your budget, so before you have too much time to think about how you’ll spend it, apply it toward your debt instead. Depending on the type of student loans you have, as well as your interest rate, refinancing your loans could save you thousands of dollars. There are many refinancing companies out there that can refinance both federal and private loans, offering you a better interest rate. Through refinancing, you pay less in interest, so you can attack the rest of the principal. Borrowers looking to refinance will need to have a good credit score, which helps lenders assess your credit worthiness. To improve your credit score, it’s important to make on-time payments for all your bills. In addition, keep your credit use to a minimum, as the closer you get to your credit limit, the more likely you are to be considered a risk to lenders. It’s important to note that all refinancing companies are different and will offer a different interest rate based on a variety of factors. In addition, you will be giving up federal protections such as forgiveness or income-based repayment through refinancing. Refinancing can save you a lot of money, but it’s important to do your research to see if it’s right for you. Does this offer value in my life? I’m a firm believer that you have to have some fun even while paying off debt, so consider going on a Spending Diet, which allows $100 per month for non-needs spending. This free program, created by Anna Newell Jones has helped people keep their spending in check while focusing on paying off debt. By capping your nonessential spending at $100, you become more aware of your purchases and free up more money to pay off debt. Cutting back is a key component to paying off debt. But what happens when you can’t cut back anymore? Make more money. This option can often be more fun and empowering than the others. To make more money, look on sites like Craigslist, TaskRabbit, Uber, and more to put your skills to use. Seek other opportunities where you can make extra income that can go straight into your repayment plan. I knew that student loan debt was holding me back from my goals, so I took action. Personally, I hate debt, so I’m singularly focused on getting rid of it. I think that it’s possible for borrowers to pursue other goals like home ownership or starting a family while they’re still in debt. However, debt can limit both your dreams and your opportunities, so work to eliminate your student loans in 10 years or less. The good new is that using these tips can help you pay off your loans and start saving for your financial future. It’s getting in the right mindset and starting to make little changes every day that will have a big impact on your debt so that you can live the life of your dreams – debt-free. 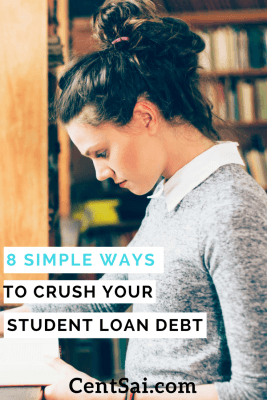 8 Simple Ways To Crush Your Student Loan Debt?